With no forward chain on the vendors side, Crofts estate agents are pleased to offer to the market this well presented and modern three bedroom mid terrace house creating an ideal first time property purchase. Enjoying the benefits of gas central heating and uPVC double glazing this lovely home is located within this sought after area. 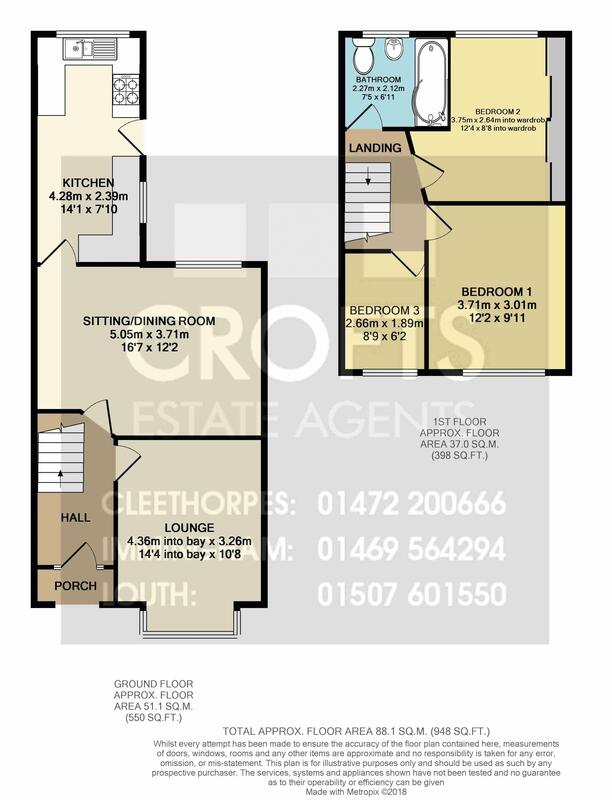 The property in question briefly comprises entrance hallway, lounge, sitting/dining room, modern fitted kitchen, landing, bathroom and three bedrooms. gardens to the front and rear with the rear offering patio area and artificial lawn ideal for outdoor entertaining The front garden provides the ability to create off road parking. Viewing is highly advised. uPVC double glazed entrance door to the front elevation with two adjoining side panels and overhead panels. Gas central heating radiator. Staircase with useful understairs storage cupboard. Pleasantly presented and having walk in uPVC double glazed walk in bay window to the front elevation. Coving to the ceiling. Gas central heating radiator. uPVC double glazed window to the rear elevation. Coving to the ceiling. Gas central heating radiator. Built in entertainment shelving unit. A modern kitchen offering a range of fitted wall and base units with contrasting roll edged work surfacing with inset enamel one and a half sink and drainer. Integrated oven and four ring gas hob with white chimney extractor over. Down lighting to the ceiling. Plumbing for a washing machine and dishwasher. Gas central heating radiator. uPVC double glazed windows to the rear and side elevations along with a uPVC double glazed entrance door to the side. Tiled flooring. Loft access to the ceiling. With uPVC double glazed window to the rear elevation the bathroom is equipped with a close coupled w.c, pedestal wash hand basin and panelled bath with shower screen and shower over. Tiled flooring and tiled splashback. Chrome effect gas central heating radiator. The master bedroom has a uPVC double glazed window to the front elevation. Gas central heating radiator. The second double bedroom has fitted wardrobes running along one wall and has a uPVC double glazed window to the rear elevation. Gas central heating radiator. The final of the three bedrooms has a uPVC double glazed window tot he front elevation. Gas central heating radiator. The property benefits from front and rear gardens with the front creating the possibility for off road parking. The rear garden offers paved patio area and artificial lawned area ideal for outdoor entertaining.